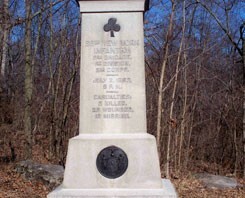 A simply designed monument, rarely sought out, yet somehow rich with history and honor, the 66th New York Infantry Monument stands proud. It marks the most advanced point the regiment attained during their charge at Wheatfield on July 2nd, 1863. It’s aura is somber, and its facade depicts the cost of war: casualties. Five killed, 29 wounded, and 16 missing. 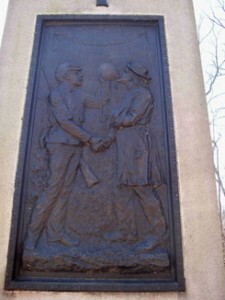 On its reverse, however, is a simple bronze plaque entitled “Peace and Unity”. 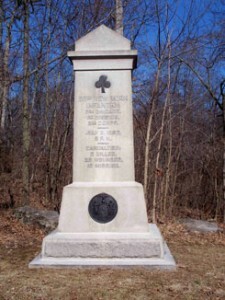 Dedicated on October 9, 1889 and costing $1500.00, the 66th New York Infantry Monument proudly displays Peace and Unity. It is a beautiful forging of two soldiers, one in Union blue, and one in Confederate grey. They are shaking hands and sharing a canteen of water, just like brothers would. Perhaps, this is what a former member of the regiment meant when he said his unit was an “…ordinary, everyday regiment”. Everyday men share a handshake and a cup of water. Everyday men are united in common purpose for peace in life. Everyday men fight for what they believe in, just as the men of the 66th did that July day, 1863. And perhaps that is why, the 66th has been honored for their sacrifice with this monument. You can locate this special monument on Sickles Avenue at the Loop. Posted in Blog, Monuments and tagged 66th New York Infantry, 66th New York Infantry Monument, Battle of Gettysburg, Confederate, gettysburg battlefield tours, Gettysburg Monuments, peace, Peace and Unity, Sickles Avenue, Union, unity on March 18, 2013 by Gettysburg Battlefield Tours.